Talk Nerdy To Me: Flippin for this Upgrade. I am a huge fan of the Flip and have purchased 7 as gifts. The Flip revolutionized the way we take and share video and with only a few buttons even the least tech savvy individual can master it. 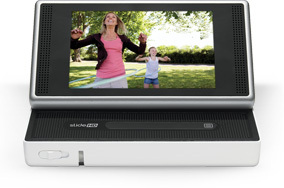 Now, meet the Flip SlideHD. Same idea - same operation - except now it has a 3" widescreen for viewing...that well, flips out. Its a must for any indiviudal - 12 hours recording time, capability to take photos and even customizable design. Likey.